"To begin with, I ran through the different Allied Air Forces which were operating in the desert war. Came the turn of the Poles. ' And what do you think about the Polish airmen?' I asked. 'Oh, them' replied the squadron Leader, 'they are fantastic - better than any of us. In every way they've got us all beat'." An excerpt from the book by Rosemary Curtis: "Winged Tenacity". Towards the end of 1942 Polish Air Force HQ asked RAF for an opportunity to send a group of pilots to the North African front in order to get "hands on" practice in operating as a part of tactical air force. That, of course, was a preparation for the tasks, awaiting them during inevitable Allied landing on European continent . Call for experienced (at least 30 missions) pilots was a popular one, with about 70 volunteers coming forward. 15 pilots were chosen, with a plan for personnel rotation every 3 months. After initial preparations in West Kirby RAF base, they embarked on an Atlantic convoy, arriving in Africa in March 1943. The unit was assigned as a "C" Flight to # 145 Squadron RAF, operating from Bu Ghara . High effectiveness and style very quickly earned them a "Skalski's Circus"	nickname. Between 28th of March and 6th of May PFT shot down 25, probably 3 and damaged 9 enemy planes. 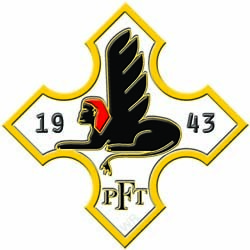 German Army in Africa surrendered on 13th of May and PFT was disbanded. Three of the pilots stayed on as a flight / squadron leaders in various RAF units.